Rajasthani Moong Dal Halwa is an Indian dessert made with skinless split green gram. It’s a very rich sweet with loads of ghee and dry fruits and is made especially for festivals or weddings. 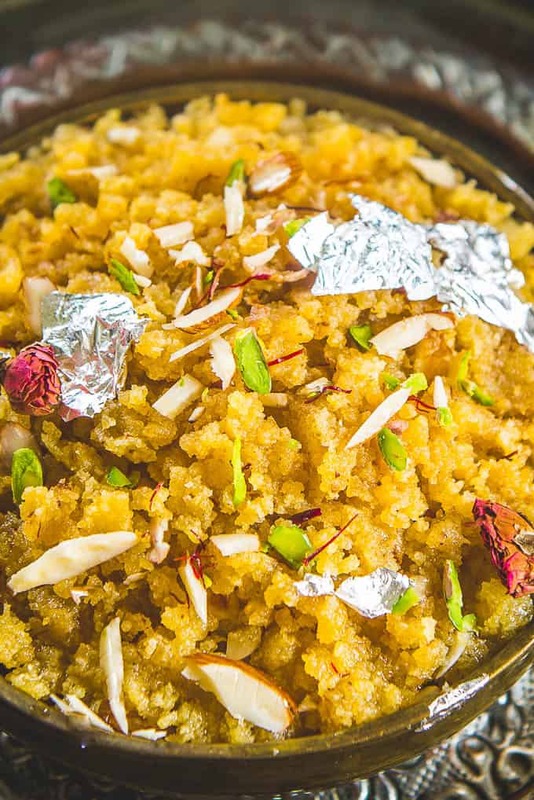 Here is how to make Moong Dal Ka Halwa (Step by Step + Video). Moong Dal Halwa is an Indian dessert made with skinless split green gram. It’s a very rich sweet with loads of ghee and dry fruits and it is made in winter months for festivals or for weddings. Rajasthan has a repertoire of many wonderful recipes and since my dad is from the state, I got lucky to taste many of them in their unadulterated form. This Moong Dal ka Halwa is one of the dishes which is a Rajasthani delicacy and if not done right can be a disaster. 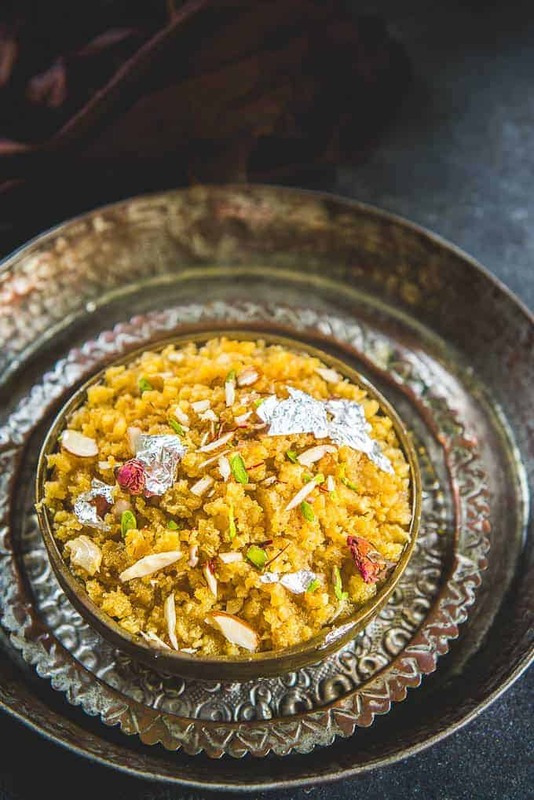 My mom made this moong daal ka halwa recipe year after year every Diwali, Holi and any special occasion, and we used to relish this sweet for days as it remains fresh for 8-10 days when kept in the refrigerator. This Moong ka halwa requires lots of patience and muscle work and also lots of ghee to come together. It also takes a long time to cook so be prepared for that. But I can assure you that the end result will be worth all the efforts. Sometimes I make this Moong Dal halwa without khoya so if you don’t have access to Khoya, this recipe is perfect for you. You can just skip adding it and follow the rest of the process similarly. The end result will be almost same. How to make Moong Dal ka Halwa? To make Moong Dal ka Halwa, yellow moong dal is soaked in water for a few hours and then added in a food processor to make a coarse paste. Now heat ghee in a pan and add the dal paste to it and stir and cook on low flame and see dal turning golden brown. 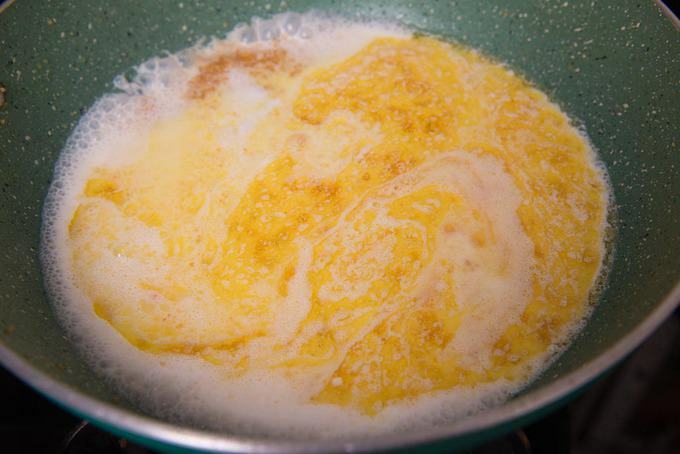 Next up, add warm milk and cook until all the milk is soaked and dal is softened. Add the sugar and cardamom powder and fry on medium flame until dal ka halwa turns golden brown and ghee starts to ooze from the sides of the pan. Moong Dal is typically used to prepare the spicy Moong Dal Curry that is served with Parathas or Rice, and Panchmel / 5 dal Curry. It is also used to prepare the delectable and Sakkarai Pongal. You cannot make a Moong Dal Halwa Recipe without enough ghee, enough time at hand and lots of stirring. So gear up your muscles and keep your diet plan on a back seat and just indulge on this halwa for special occasions. Here is how to make Moong Dal Halwa. 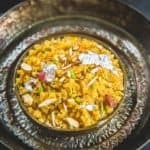 How to make Moong Dal Halwa in Microwave? To make Moong dal Halwa in microwave, grind the dal and transfer it in a microwave safe bowl along with ghee. Micro at high for 5 minutes. Stir the mixture and keep on cooking for 5 minutes, until all the water is evaporated and the dal turns brown. Add milk and micro for 5 minutes. Add khoya and micro for another 5 minutes. Now add sugar and cardamom powder and micro in batches of 5 minutes until the halwa turns brown and the ghee starts to separate. Garnish with almonds and pistachios and serve. How to make Moong ka Halwa without Khoya? 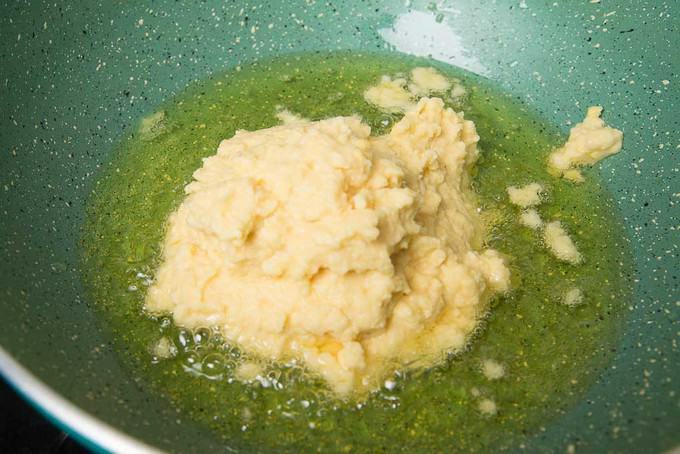 To make Moong Dal halwa without Khoya, follow the below process and just skip the khoya. The result with be a good tasting halwa which is slightly less rich than the real deal. 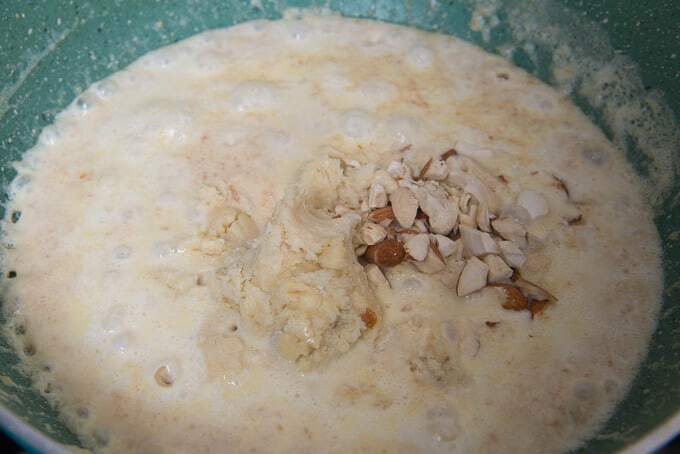 You can also make khoya using milk powder if normal khoya is not available and then use it in the halwa. 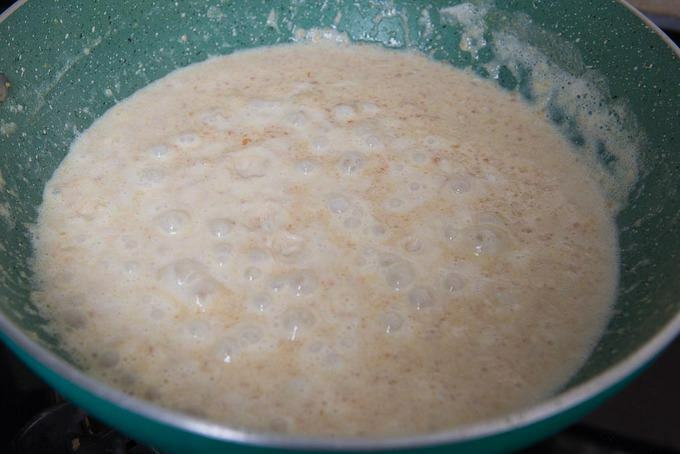 Read a detailed process to make Khoya from milk powder here. 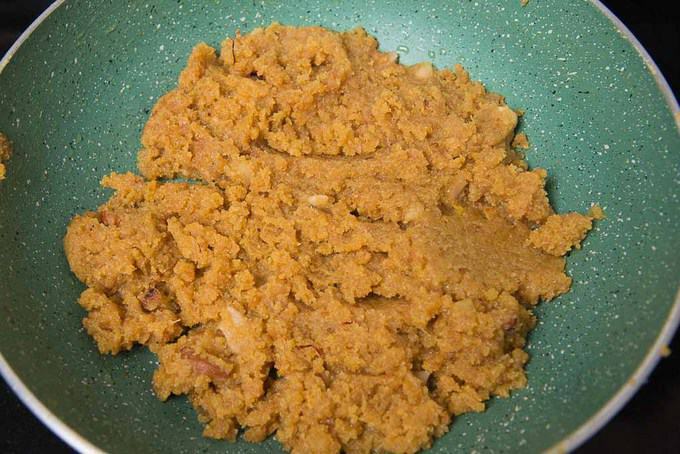 How to make Moong Dal Halwa using Jaggery? To make moong dal halwa using jaggery, replace the sugar with grated jaggery. Keep the remaining process same. Also make sure to source the jaggery from a trusted source. They add a lot of harmful chemicals in jaggery to make it look good but they are very harmful for the body. So go for organic jaggery from a trusted source. This recipe is a labour of love, so repeat after me “there is no short cut to make this recipe”. Roast the dal in ghee on low heat until it turns golden brown in color. This step takes 25-30 minutes but trust me it makes or breaks the halwa. This halwa keeps good for a long time, so you can refrigerate it for upto 10 days. To re heat the halwa, the best is using a microwave, but you can re heat it in a pan over stove top. Sprinkle a tbsp of milk while heating. My mom roast the halwa after adding the sugar in microwave. It reduces some of her muscle work. You can also try the method. Follow the process until adding sugar. Then transfer the halwa in a microwave safe pan and micro for 10-15 minutes, stopping the microwave at every 5 minutes and stirring the halwa. Do this until halwa becomes brown and ghee starts to ooze out from the sides. Wash and soak moong dal in water for 5-6 hours. Drain the water completely. 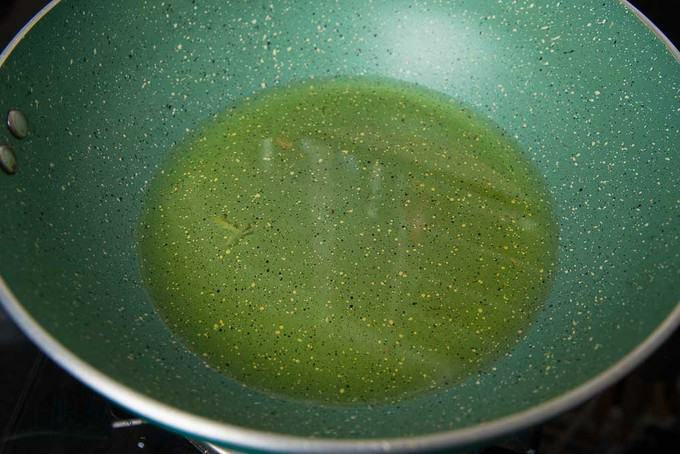 Grind the dal coarsely in a bender without any water. Be careful to not grind the dal to a smooth paste. Fry the dal on very low heat till it turns light golden brown. Add milk and cook till all the milk is absorbed by the dal. Add the khoya and dry fruits. Mix well. Now add sugar, cardamom powder and saffron. 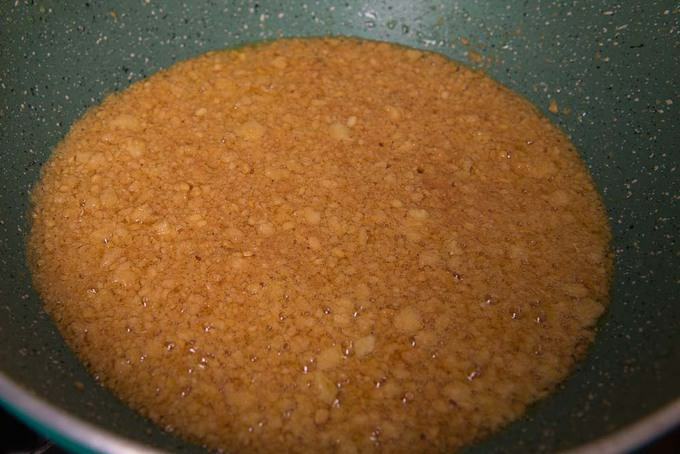 Cook on low heat till the halwa turns brown and starts to leave ghee from sides. Keep stirring continuously during this process. Or else, fry the halwa in mirorwave like my mom do. I have mentioned the process in the tip above. Moong Dal Halwa is an Indian dessert made with skinless split green gram. It's a very rich sweet with loads of ghee and dry fruits. Wash and soak moong dal in water for 5-6 hours. Add the khoya and dry fruits. Add sugar, cardamom powder and saffron. Cook on low heat till the halwa turns brown and starts to leave ghee from sides. 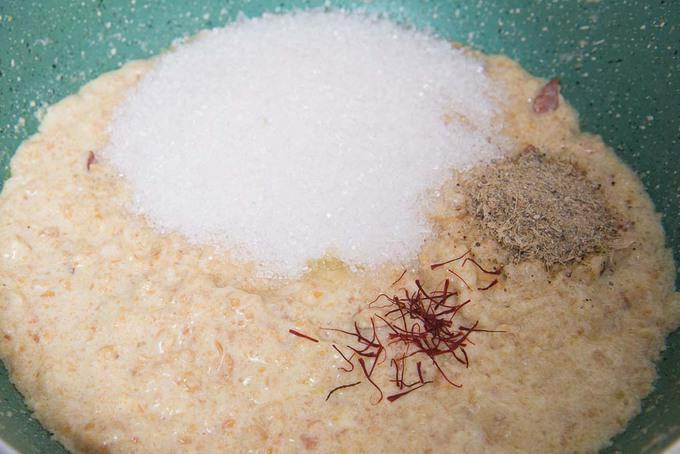 You can store this halwa in an airtight container for up to 10 days in refrigerator. Just warm it in microwave before serving. Can you please suggest substitute for Khoya. Hi, You can make this recipe without khoya. Just skip it. Result will not be too different. Halwa turned out delicious!! thank you so much!! I used a non stick pan but still the grounded dal stuck in the pan and I couldn’t prepare the halwa. Can you please help me? 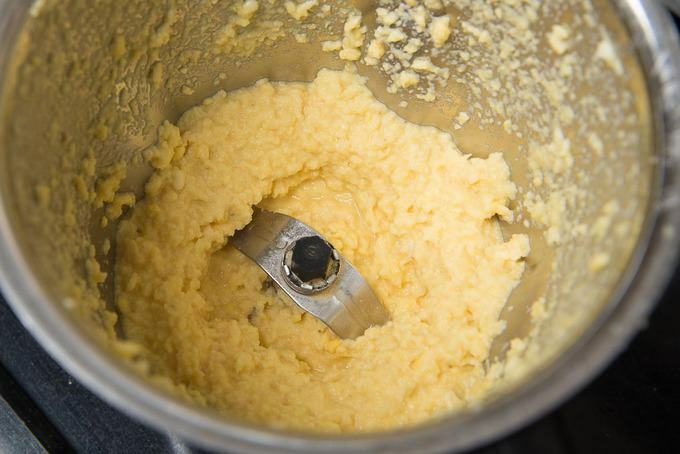 Did you use less ghee. This halwa requires a lot of ghee and that is a must for the dal to fry properly.